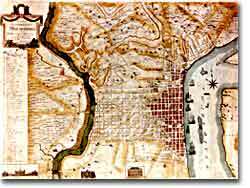 The commercial center of Philadelphia in 1796 was located along the western shore of the Delaware River. As always, Washington was extremely sensitive to the importance of public appearance and he used his departure to publicize a major final statement of his political philosophy. Washington's Farewell Address has long been recognized as a towering statement of American political purpose and has been read annually in the U.S. Congress as part of the national recognition of the first President's birthday for over 100 years. Although the celebration of that day and the Farewell Address no longer receives such strenuous attention, Washington's final public performance still deserves close attention. George Washington delivered his Farewell Address from Congress Hall in Philadelphia. 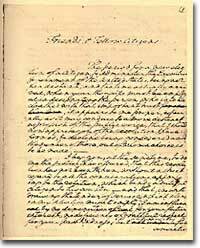 George Washington's handwritten copy of his famous Farewell Address. Alexander Hamilton helped Washington edit his first draft. Find out how Hamilton, Madison, Jay, and Washington worked together to create this historical milestone and what it said about religion, political parties, and more. Washington's 1796 Farewell Address expresses his hope that America will stay out of the conflicts of foreign nations. But this philosophy stood in contrast to earlier actions. A 1778 treaty with France called for a "true and sincere friendship" between the two countries. Read the text of this treaty here and then compare it to the Farewell Address to see the difference. From his military career fighting for the British crown during the French and Indian war, to commanding the Continental army during the Revolutionary war, to his role as our first President, George Washington remains one of the most fascinating and important figures in American history. Read all about it. John Jay's notion that America needed to avoid foreign force and influence comes through in George Washington's Farewell Address, a document Jay helped draft. These ideas pop up in another of Jay's works, Federalist No. 2.